Seattle jeweler Whitney Stern first started designing after an inspiration-filled college trip to South America, and has since been featured in Lucky magazine and at Nordstrom stores near you. Most recently, though, she launched a custom bridal line that runs the gamut of traditional emerald-cuts to modern, colorful baubles. We chatted up Stern about her newest venture below. Our favorite part: She sports a wedding ring made by her own jeweler grandfather. Talk about full circle. Did you always envision doing bridal jewelry? It actually just kind of happened! Over the last seven years our bridal collection has naturally evolved. Many of our customers who are attracted to our main lines inquire about designing a custom engagement and wedding piece with us. As a result, we've intentionally expanded this part of our business and we've been working with clients one-on-one to design the perfect ring of their dreams. It's a very rewarding and special process. Is there anything different about designing bridal? There is much more meaning in bridal jewelry. I truly believe that the ring you wear not only reflects your aesthetic and unique taste, but also represents the connection and commitment you make with your life partner. It's powerful to be an integral part of this process and to know that the piece we help our customers design will travel with them throughout their lives and get passed down for generations to come. This emerald-cut diamond with a small antique-style halo of diamonds floating around it. It's simple, elegant and timeless. What ring trends are you seeing from your clients? This year, color jewelry is on the rise! We're seeing strong hues of blue, aqua, emerald green, deep purple, and even true red. I love when customers are open to a pop of color since this really enlivens a person's style. In the Seattle area, people are take bigger risks with color jewelry. 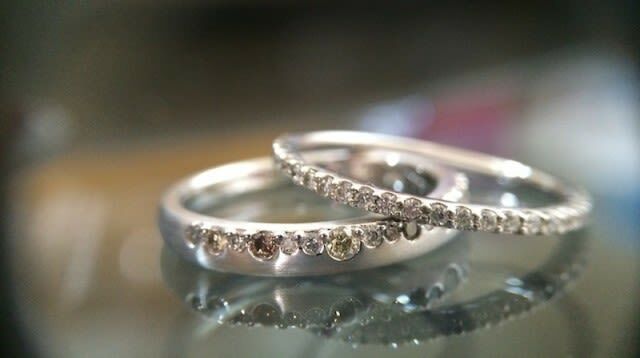 If you were designing your own wedding ring what would it look like? Actually, my wedding ring is the exact ring I would have designed for myself. My great grandfather, who was also a jeweler, made it by hand in 1945. It is a platinum, wide, eternity-style ring with small diamonds going all the way around in the shape of hearts, leaves, and third eyes. I love everything about it and it really represents me in style and essence. I am honored to carry a piece of my past with me everyday.